At SGS Engineering, we offer a selection of Milwaukee and OX jab saws. Also known as drywall saws and keyhole saws, our jab saws are great choice for both professional tradespeople and DIY hobbyists. In this category you can find selection of Milwaukee and OX Tools Jab Saws. 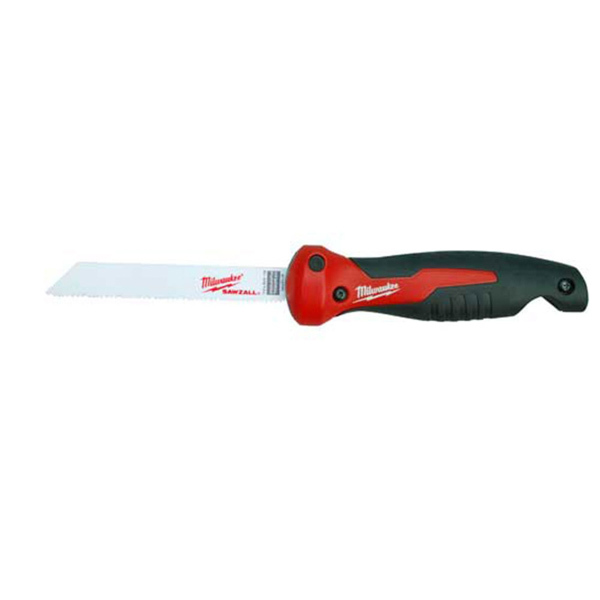 The Milwaukee Folding jab saw is a simple and effective tool with free blade change to avoid losing time on the job. The Milwaukee Rasping jab saw has a extra strong thicker blade making it more resistant for plunge cuts and is coated for corrosion protection. The OX 165mm Trade Jab Saws featured with holster packs offer blades with teeth is ideal for wood, plastic and drywall. Choose from the Milwaukee 150mm Rasping Jab Saw, or the Milwaukee Folding Jab Saw, for a high-quality, specialist tool that can save you time on the job. Our jab saws are suitable for multiple purposes, including drywall saws, jab saws for metal and jab saws for wood. We also offer retractable and folding jab saws, meaning that whatever your project, we have a keyhole saw for your requirements. Explore our collection to find the best jab saw for on-site work or home DIY. Here at SGS Engineering, we have a time-saving keyhole saw for all of your cutting and shaping needs. Available from the Milwaukee range is the Milwaukee 150mm Rasping Jab Saw. This is one of the best drywall saws on the market as it is unique in design, with rasping holes integrated into the thick, extra strong, six-inch blade. Alternatively, the Milwaukee Folding Jab Saw is a compact option designed to fit different blade sizes, providing precision for a variety of jobs. When you buy equipment from SGS Engineering, you can shop with confidence. Milwaukee jab saw blades have been produced for precision and comfort, with a coating designed to reduce corrosion, so they are able to handle the toughest of jobs.